CR 18505 at North Yard, Detroit, on 9/7/97. Photo by Jeff Feldmeier (39k) CR 18518 in service at Trenton, MI on April 6, 1997. CR N-11 18526 upon delivery to Rochester Museum. 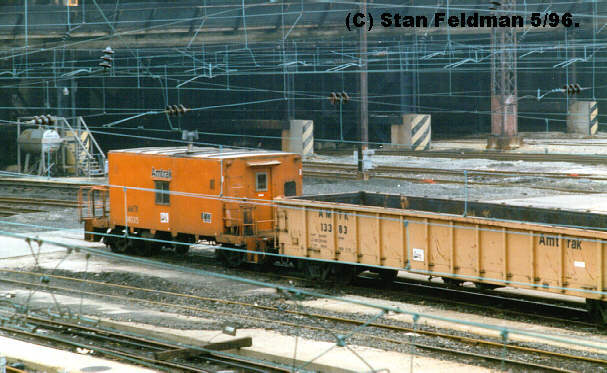 Photo by Christopher R. Hauf (104k) An Amtrak caboose in the Penn Coach Yard, at Philadelphia PA in May '96. Amtrak acquired several of this class and renumbered them in the 14000 series. 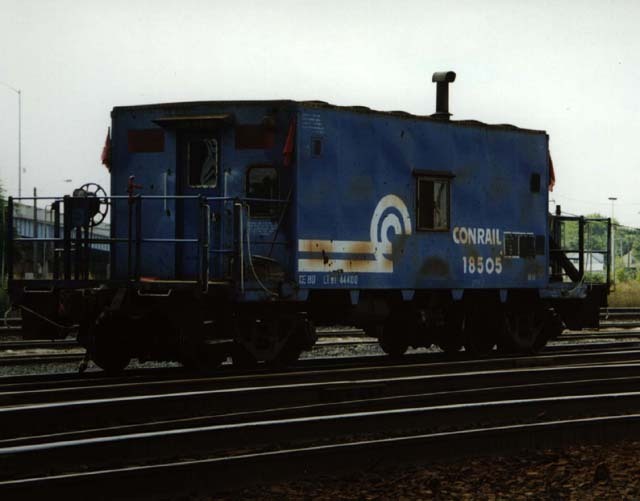 140 cars 18450-18599 ex PC 18450-18599, ex PRSL 250-252. Transfer type, small end platforms, no cupola or bay windows. The carbody of these cars is the same size as the N-6A/N-9/N-9E cars but the end platforms and truck centers are shorter. 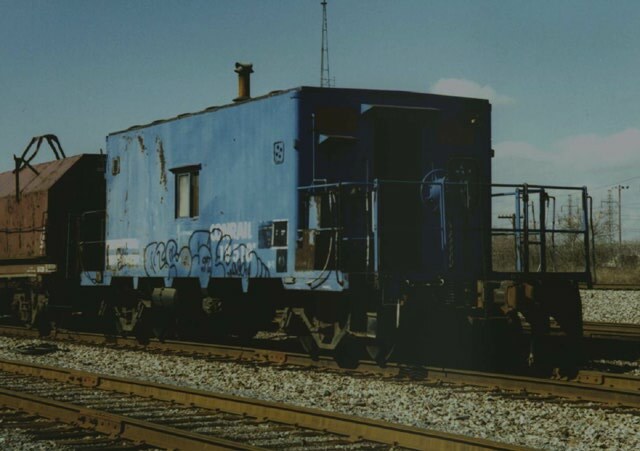 There were 75 N-11s and 75 N-11Es built in 1969 and 1970 by the PC at their ex NYC Despatch Shops. I don't know where the break was in the 11/11E group. Three of these cars came from the PRSL and were renumbered into slots left vacant by PC era scrappings, numbers were 18559,18564 & 18565. Sources : Rail Classics, July 1988 and Rails Northeast, October 81, from photos. This class would have to be scratchbuilt, frame is shorter than N-6A and N-9/9Es. Some Athearn bay window caboose parts could be used. The N-11 has pullman type steps and open gratings on the end platforms. The end railings are of a simpler design than the other transfer types. 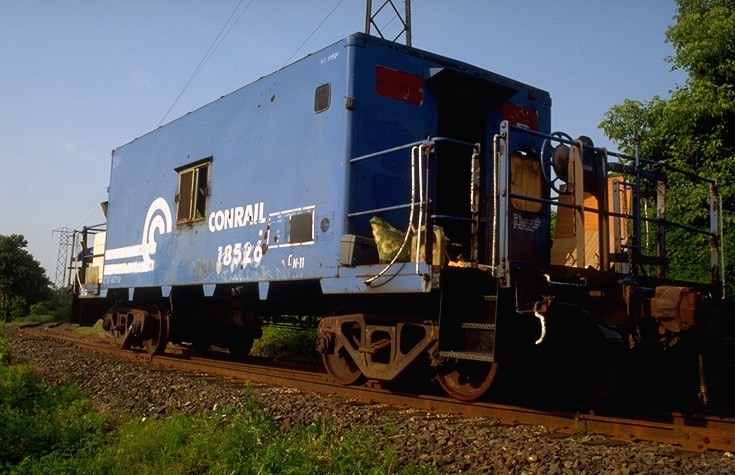 "Conrail Cabooses," Frank A. Czubryt, Jr. Rails Northeast. Oct. '81, Pages 22-35. Photos and class number information. I would like to obtain a copy of this article.